Located in a breathtakingly beautiful position between Lake Annecy and Mont Blanc, Le Grand-Bornand is a prime ski resort and a member of TOTFA, the select Top of the French Alps club. Only 15 resorts in France hold this prestigious accolade. Despite the quaint appearance of a traditional mountain village, this world-class ski-resort is a top destination for skiers of all abilities. 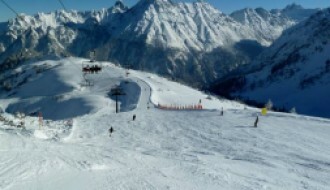 With its altitude, Le Grand-Bornand has a regular dusting of fine snow, keeping the slopes in pristine condition. Snow at the base reaches up to 90 cm deep but at the summit this increases to a staggering maximum depth of 365cm; over three metres of snow. 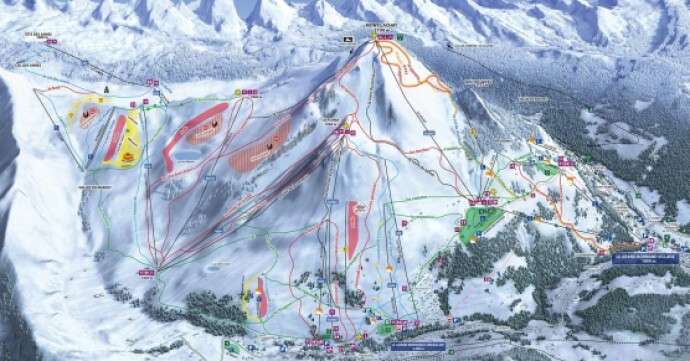 Skiing here appeals to beginners and seasoned pros alike thanks to a wide range of difficulties across the slopes. There are the gentle pastures of the Col des Annes for easing in newbies. Or for a greater challenge, Mont Lachat offers some more difficult routes. Over 90km of ski runs cater to all. When it comes to things to do in Le Grand-Bornand, there are plenty of options. For those who want to take a break from skiing, there are walking paths connecting the Grand-Bornand village with the rest of the resort, including the Grand-Bornand Chinaillon located at 1300m above sea level. 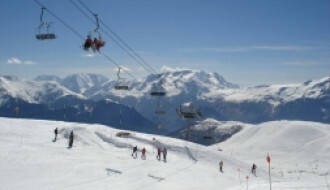 One of the best snow parks in France is located at the top of the Maroly region of the resort. Grab some snowshoes and explore the area or become a thrill seeker and discover ice-climbing, or even paragliding. Le Grand-Bornand has something for everyone, and that includes the kids too. There are several fun playgrounds, sledging areas, baby snowboard lessons, trampolines, and even dog sledding, all designed to keep the whole family happy and entertained. There’s plenty to experience for those living in Le Grand-Bornand. There are many heritage trails designed to allow you to explore the culture and history of the whole area. These include walks out to the weekly market at the Grenette, which was originally a grain market in the heart of the old town square. The square also doubles as a venue for concerts including live music by the local brass bands. Evidence of the French Revolution can be found in artefacts such as the Saix Stone, which describes difficult divisions within the local populace hundreds of years ago that seems impossible here nowadays. Other famous monuments include the cross at Le Clos du Pin, a 16th-century icon thought to be the oldest cross in Le Grand-Bornand. For a more up to date hit of culture, there are regular movie showings in the Le Grand-Bornand village cinema. Food ranges from Italian pizza to traditional Savoie cuisine and everything in between, whilst the bars will keep you warm and toasty, either with a hot chocolate or something a little bit stronger. Le Grand-Bornand comes across as lively, enticing and filled with wonderful things to do. Investors will find a range of properties to choose from, including single bedroom apartments in a large chalet complex, right in the heart of the village or on the edge of the slopes. Or, for something high-end, how about an enormous 14 bedroom villa standing proud against the dramatic Alpine backdrop? There are plenty of options in between, from family homes to apartments perfect for couples. 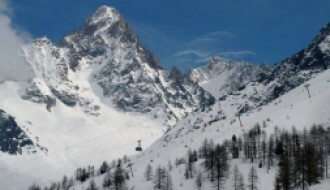 Recent developments include some new, comfortable chalets close to Le Rosay lift, the longest gondola ride for those based in the village. The chalets have been customised by young aspiring artists. There's also the 2018 addition of Gypaète, a new piste offering an alternative route to the renowned Dénivel'Maxx which has a descent of 1100m to the village. According to the historical weather report, Le Grand-Bornand enjoys a wonderful summery feel in July as temperatures hit highs of 24 degrees Celsius, despite continuing snowfall throughout the year. Winter, particularly January, sees temperatures fall below freezing, preserving the picture postcard look of the nearby chalets. The nearest airport to the resort is Annecy, which is around an hour away or a little less, depending on conditions. It’s also possible to fly to Geneva or Lyon-Saint Exupéry, although the transfer times are much longer from these airports. Trains stop at Annecy from most major cities, so this is an alternative option for those unable to fly to Annecy for any reason. Bus services run from Annecy and Geneva to Le Grand-Bornand.